Like most people, and entirely unlike my daughter, I like breakfast breakfast. She would much rather sit down to a pizza, nachos, or hamburger for breakfast, for some reason. I didn’t foster this, I promise. She used to get up and eat cheese grits every morning, she did, but that stopped pretty much once puberty hit and she started wanting to sleep in all day. She’s a little weirdo, God Bless her, but she already knows it, so well, yeah. Let’s just leave it at that. Anyway…she will eat homemade cinnamon rolls, but I’m not Betty Draper so I usually don’t make homemade breakfasts unless it’s a holiday. When I do make or bake homemade breakfast things, my girl usually will show up to the table, as with the aforementioned cinnamon rolls. Sometimes though, when I make cinnamon rolls, I make other kinds. Like orange rolls, or birthday cake rolls, or red velvet rolls. Wherein lies a problem. 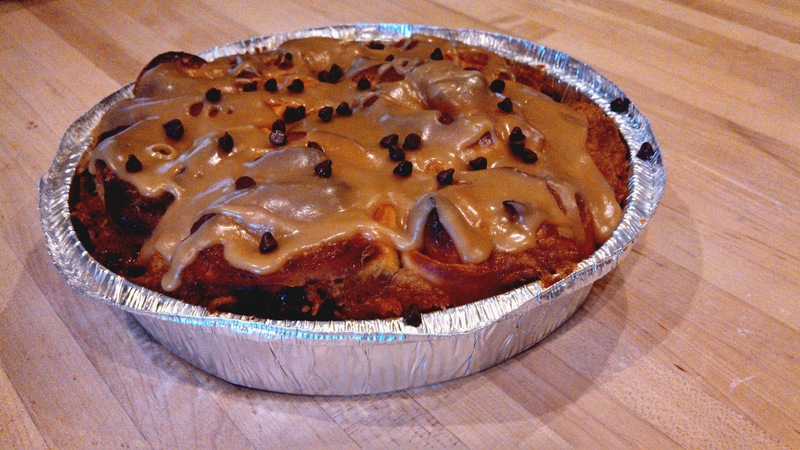 Most of the recipes I’ve found online for the other kinds, are all cinnamon roll based. Don’t get me wrong, but when I eat red velvet, I want it to taste like red velvet, not red velvet cinnamon. When I want to eat birthday cake, I want it to taste like birthday cake and not cinnamon birthday cake. You get it. Not that there’s anything wrong with cinnamon, but I am a purist in many ways when it comes to certain foods. Obviously, non-cinnamon cinnamon rolls being one of them. Sorry, cinnamon lovers! 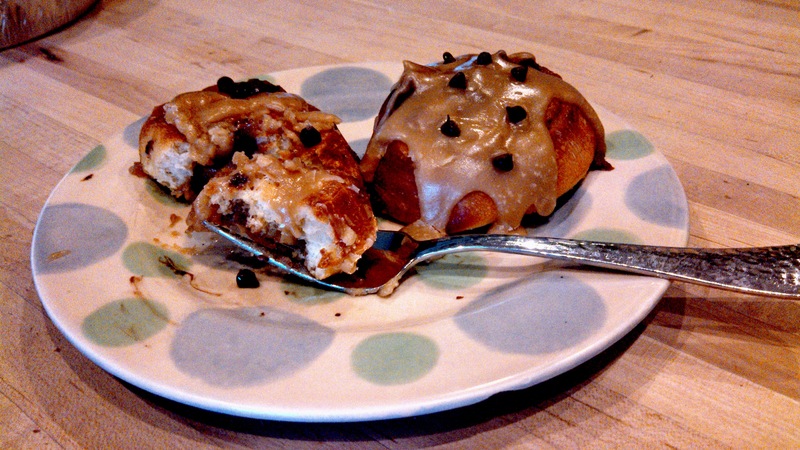 So when my son, who is away in the Air Force, requested I make and mail him chocolate chip cookie dough anything (his absolute favorite) for his birthday, I started looking for a chocolate chip cookie dough breakfast roll. However, I could only find ones that had cinnamon in the filling. So I improvised and left out the cinnamon. And, most had a vanilla glaze, but I wanted to give my 6’3″ baby the most cookie dough bang for his buck, so I went with a brown sugar glaze, because butter, brown sugar and vanilla really make up the whole cookie dough flavor anyway. Really, these couldn’t be any simpler to make. I found out that the cookie dough filling made enough for the rolls, and enough was left over for me to nosh on for a few days afterward. Win/win in my book! The final product was a winner too! Even though they were a few days old by the time my son got them in the mail, he was happy. (It was his first birthday away from home, so it was the least I could do to let my momma-ness play out fully….) I did make a couple teeny tiny ones for the rest of us to try, and I must say, they were delicious! And honestly, the brown sugar glaze on top, sprinkled with mini chocolate chips really rounded out the cookie dough flavor. Note: Make cookie dough ahead of time to allow it to sit in the fridge for an hour or so before baking. This will hopefully keep it a little gooey-er as it bakes. 1. Cream together butter and brown sugar and vanilla. Add in flour and salt. Don’t worry – the mixture will be crumbly so add in 2 T of milk and mix. The dough should look like normal cookie dough; if not add another t of milk if needed. Fold the chocolate chips and nuts. *Store in the refrigerator for at least an hour before crumbling onto the dough. Any leftovers (!) can be stored in the refrigerator for a week or in the freezer for a month. 2. In a small saucepan, heat milk until tiny bubbles form along the edge of the pan. Remove from heat; add sugar, salt and butter. Allow mixture to cool until lukewarm. 3. Measure warm water into the mixing bowl of an electric mixer which has been fitted with the paddle attachment. Sprinkle yeast over top of water; stir in and allow to sit for 10 minutes. 4. Add lukewarm milk mixture, eggs, and flour. Mix for 3 minutes. 5. Cover tightly with plastic wrap and refrigerate for 2 hours or overnight. 6. The next day, or when completely chilled, knead by hand on a lightly floured work surface or knead by machine fitted with the dough hook. Knead until smooth and elastic, adding as little flour as possible. 7. 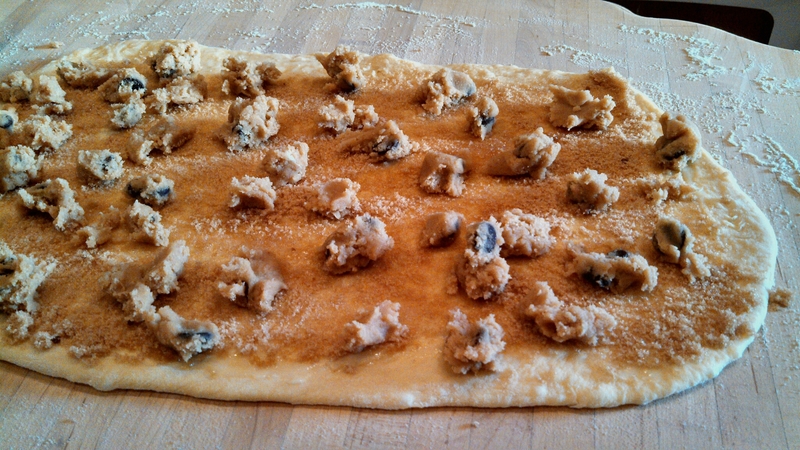 Roll the dough to 1/4-inch thickness. Spread with butter, sprinkling with brown sugar. Crumble chilled cookie dough over evenly over the rolled out dough, then roll the dough in a spiral, pinching ends in well to contain the cookie dough. Slice the rolls about 1 inch thick and place in 9″ cake pans (I used an aluminum one for the picture so my son could throw it away) that have been brushed with melted butter. 8. Let rolls rise for about 1/2 hour. 9. Bake at 350°F for 18-25 minutes or until golden brown. 10. While rolls are baking heat butter and sugar in a small saucepan over medium heat, stirring, until sugar has dissolved. Add cream, vanilla, and salt, and bring to a boil. Remove from heat, and whisk in powdered sugar until glaze is smooth. Cool a bit until thickened and pour glaze over rolls after they come out of the oven. Garnish with a sprinkling of mini chocolate chips. Enjoy! *For a printable version, click on the recipe title above. Thanks for stopping by… I do love curry!